INDIANAPOLIS – Juan Pablo Montoya repaid team owner Roger Penske for believing in him with a victory Sunday in the 99th running of the Indianapolis 500. 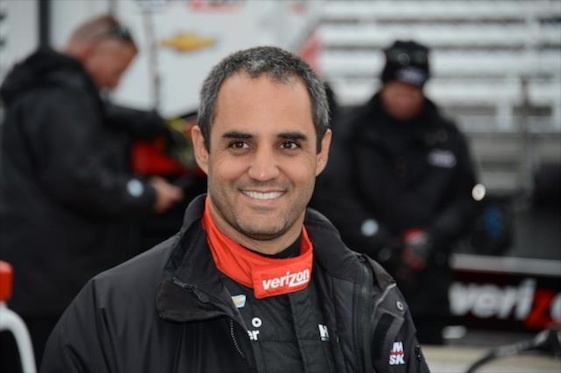 Montoya won the 500 as a rookie in 2000 while driving for Penske rival Chip Ganassi. But the Colombian driver then left IndyCar racing, first for Formula One and then NASCAR. Now, 15 years later, he is again the Indy champion, this time extending Penske’s record for wins in what many consider the biggest race in the world to a mind-boggling 16. But it wasn’t an easy win as Montoya had to overcome an accident near the beginning of the race and a misstep in the pits as well as outdueling teammate Will Power and Ganassi driver Scott Dixon over the last 100 laps. The 78-year-old Penske, who rarely shows much emotion, appeared elated as the Chevrolet-power winner crossed the yard of bricks finish line. Montoya, who led 167 of the 200 laps in 2000, led only nine laps this time and didn’t take the lead for good on Sunday until lap 197, shooting from third to first with a pair of breath-taking outside passes on the 2 ½-mile oval, then holding on to the top spot to the finish line. He crossed the line just 0.10 seconds – about one car-length – ahead of Power. Montoya averaged 161.341 mph in the race slowed by sixth caution flags for a total of 47 laps. Charlie Kimball, who ran a solid race, managed to squeeze past teammate Dixon near the end to finish third, with Graham Rahal and Marco Andretti fifth and sixth. Helio Castroneves, another Penske driver, fell short in his try for a fourth 500 victory, finishing seventh. A year ago, Penske took a chance on Montoya, whose NASCAR career was very pedestrian, As it turned out, last year’s Indy 500 was his first oval race for Penske and he qualified 10th and finished fifth, giving the team an idea that he could be a serious contender again with some time in the car. Considerably more comfortable this year, Montoya came into Sunday’s race leading the series points and as one of the favorites to win. But Montoya’s race nearly ended on lap seven when Simona de Silvestro rammed the back of his car while driving under caution, nearly knocking off a piece of the Penske car’s bodywork. The caution was extended and Montoya was able to pit and have his rear wing assembly replaced, but he fell all the way to 30th in the 33-car field before the restart. He charged back into the top 15 before making a mistake on his first pit stop, sliding through his pit on lap 41. This time, he came out of the pits in 18th. But there was no holding the 39-year-old Colombian backon Sunday as he charged into contention by lap 100, chasing pole-winner Dixon and Power, who had dominated the early part of the race along with Penske teammate Simon Pagenaud. Montoya led for the first time under the green flag on lap 165, passing Dixon for the top spot. But he and Power and Dixon swapped the top spot six times in the final 25 laps before Montoya took the lead for good. Dixon, who led a race-high 84 laps, said he faded at the end because his handling began to go away. After several spectacular crashes in practice that saw race cars flying through the air and put everybody on edge heading into Sunday, everyone stayed on the ground. There were several crashes in the race, including one on pit road in which two crewmen were knocked down by the sliding race car of James Davison. Neither of the crewmen was seriously injured and there were no drivers injured. Margin of victory: 0.1046 of a second. Verizon IndyCar Series Point Standings: 1. Montoya 272, Power 247, Dixon 211, Castroneves 206, Rahal 204, Newgarden 173, Bourdais 161, Kimball 160, Andretti 151, Kanaan 147.